Hello! I'm P.Cleland. 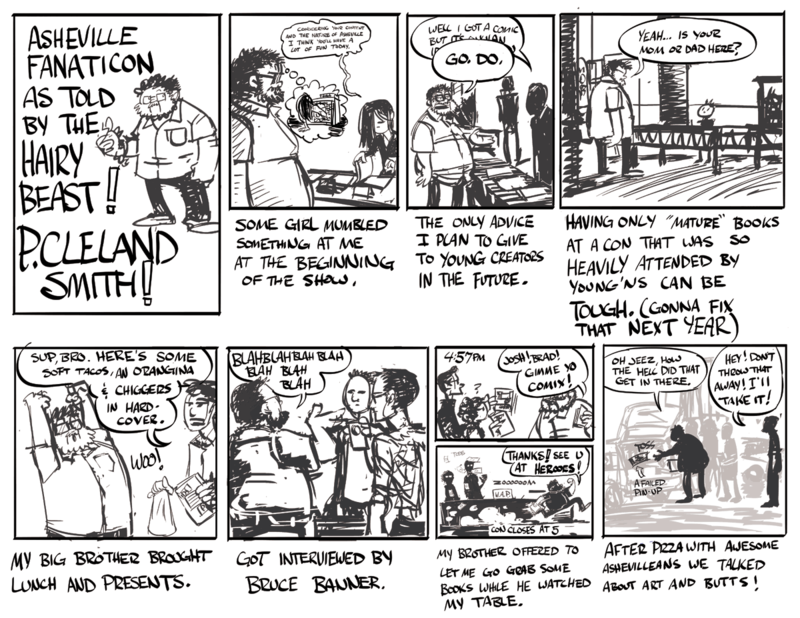 I make this comic on days that I'm not working at a hardware store in Bishopville, SC. Apparently some folks like this comic and I hope you do too. please come back to the website because new stuff is posted at least once a week if I can help it. Man o man! heroescon was fun! I want to thank Dustin Harbin for hosting the event and bringing the hugs! no one loves more than this guy. and he did me a super duper solid by letting me have a table at indie island.. If It’s at all possible I will be very grateful to be back next year. I will be doing a few recap comics that I will hope to post on twitter in the future so be on the look out for those. In the meantime take a look at the latest page of real cane sugar.. in my rush to make enough pages for a full third book of real cane sugar I’ve yet to make a new page for next week.. OH BUT REST ASSURED! there will be something to look at this week and the next! I promise. 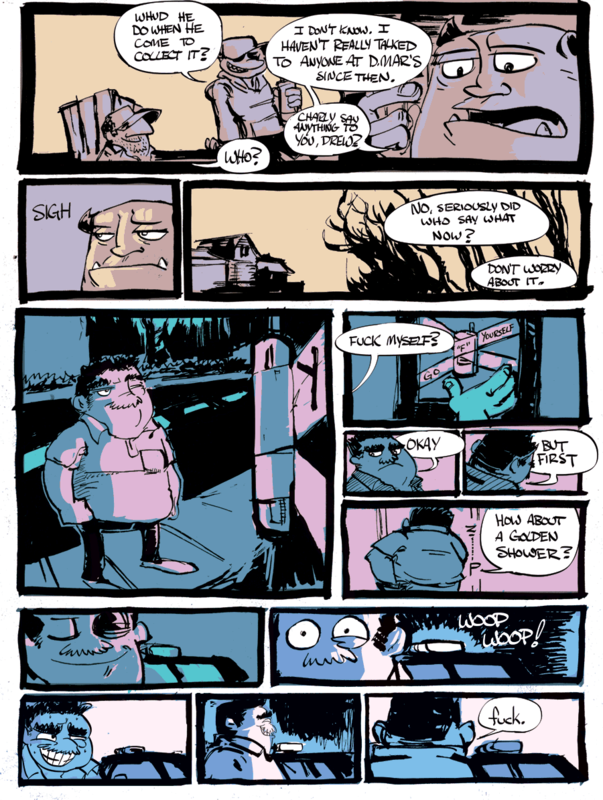 If you want to see the comic in full size just click the image and then it will be all big and such. So, Fanaticon was a fun time. I got to meet a lot of cool people who were very nice to me and gave me money. I hope to see some of you again at HeroesCon. The people I met were easily the best part of Fanaticon. my buddy’s Josh Latta and Evan Dahm strolled by the table more than once and asked how I was doing and I was often looking from my table to see how they were doing, bros gotta look out for one another and such. After hard days work Evan and Lela organized a dinner with some cool kids from around Asheville. Raven and Steph (I think it was steph.. it was steph, right? (she makes awesome buttons)), Brent and Tizi (who gave me a copy of their first comic ever called Mickey’s First Day, a comic about hairstyling told from experience) and Hope (woooo!) and Brian (holy shiiiit!!) along with my brother and myself had a delicious meal from Asheville Pizza and Brewery. As the dinner wore on folks started having to head home unitl it was me, Evan, Lela, Raven and Steph in the parking lot looking at originals and trading buttons and books and so on.. I was really tired and had to keep slapping myself to stay awake while on the way to my Bro’s house where I crashed! The nice thing about having a table and selling books is that I’m not buying every book I see. The books I did get were quite enjoyable I started with Josh Latta’s “A Rabbit in King Arthur’s Food Court” which is a funny little Carl Barks inspired comic featuring Rashy Rabbit, a character that I’ve enjoyed watching evolve for the past 3 years. After that was the Fast Food Fued by Brad McGinty which was simply delightful, the art massages the eyes and the humor tickles the funny bone. I read all of Chiggers in one sitting and loooved it.. Any kid who’s been to any camp will have no trouble identifying with it. I’m going to be looking at a lot more books that could easily capture the imaginations of younger audiences while still being good and cats like Hope Larson and Aaron Renier are proof positive that it’s possibly to make great stuff for all ages without talking down to them or sugar coating stuff. Come back in a little bit when I start posting pages of real cane sugar so I can have a THIRD comic to sell at heroes!! I WILL HAVE 3 WHOLE COMICS for sale at heroes.. you need to have more than one comic for your first heroes con, fellas! Even if just one of you guys who read this site come out it will be AWESOME! we’ll party, it’ll be great.